After a variety of stumbling blocks and false starts, the Treaty of Lisbon is now in force, despite the widespread instability let loose in the last two years as protectionism reared its terrified head in many EU Member States and nationalisation and massive state support for the national banking sector became panaceas for the global financial drama. Nonetheless, forces are still at large that seem to threaten the basic freedoms of the Union and to undermine the future of the common market. Given these circumstances, in June 2009 the Institute of European Public Law of the University of Hull assembled a range of experts in relevant fields to offer papers and reach some consensus on what has been achieved in the EU legal order and what the future holds for that order given local tensions and global uncertainty. This remarkable volume reprints those papers. • constitutional pluralism in the EU. 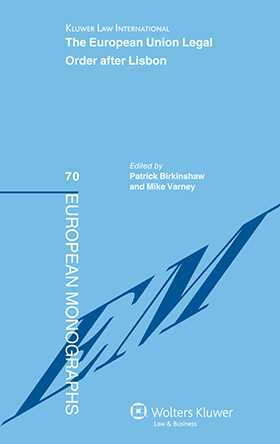 An authoritative appraisal of challenges facing the process of ‘Europeanization’ at a time of considerable uncertainty for the European Union and its legal order, this volume examines the present state of development of different areas of European law and reflects on the future for these areas in the light of the impasse on constitutional and legal reform and their eventual resolution. As such it will prove to be highly relevant to current and future debates in this area and should be of considerable interest to scholars in European law, politics and allied fields. Introduction; P. Birkinshaw, M. Varney. Part One: The Future of the European Union Legal and Political Order. The Future of European Public Law; J. Schwarze. The Future of the European Order; J.E Fossum. The EU and Global Administrative Law; J.-B. Auby. Governance and Constitutionalism in the European Order; A. Menendez. Part Two:The Future of Regulation. Legal Control of Regulatory Bodies: Principle, Policy and Teleology; P. Craig. Financial Regulation: From Harmonisation to the Birth of EU Federal Financial Law; T. Tridimas. The State, Competition and Public Service; C. Bovis. Regulating Media Markets: The Need for Subsidiarity and Clarity of Principle; M. Feintuck, M. Varney. Part Three: Citizenship and Human Rights. EU Law’s Fundamental Rights Regime and Post-national Constitutionalism: Kadi’s Global Setting; G. Anthony. Citizenship and European Democracy: Between the European Constitution and the Treaty of Lisbon; M. La Torre. The European Asylum Policy: Between Myth and Reality; D.U. Galetta. Transparency and Access to Documents; P. Birkinshaw. Part Four: Constitutional and Legal Principles in an Uncertain Order. Multilevel Governance and Executive Federalism: Comparing Germany and the European Union; J. Ziller. The Role of European Judges in an Era of Uncertainty; J. Bell. The Esoteric Dimension of Constitutional Pluralism: EU’s Internal Constitutional Sub-units and the Non-symbolic Cumulative Constitution; C. Kombos.